I saw a Facebook post on Saturday, coming from a journalist covering the wake of Kian Loyd delos Santos. Kian’s mother is an OFW, a voting bloc that is also pro-Duterte. Fortunately she wasn’t asked the same question. It wasn’t clear who asked the question, and why it was asked in the first place. No explanation was given about its relevance — real or imagined — to Kian and his death. The 23 members of the powerful Senate meanwhile could only give out muffled noises. No lawmaker has called for a special joint session of Congress to question or challenge the drug war, in exercise of the legislature’s constitutional duties and in the face of 12,000 unexplained deaths. Nothing too came out from the Regional Trial Courts, the Court of Appeals, the Supreme Court — except for a couple of writs of amparo. It feels like we didn’t have any prosecutor who was bold enough to express that a murder case would be filed and docketed as “People of the Philippines” vs. the members of the death squad that murdered Kian and their commanding officer. Most of the alphabet soup of acronyms representing the agencies of government were “panis”. The PDEA, NBI, PNP-CIDG, PAO and the others were silent — as if they didn’t exist. The solicitor-general and the justice secretary — both always always eager to grab the media spotlight in order to demonize and threaten political foes — were unavailable. All the justice secretary could do is release an order. No statement of condolence or condemnation. The solicitor-general — the so-called “tribune” of the Republic — was dumbstruck, perhaps by his own pettiness at the sight of a most heinous crime perpetrated by members of the police. The city government of Caloocan, where Kian and his family reside, is quiet too. No expression of outrage for the young boy from Sta. Quiteria. 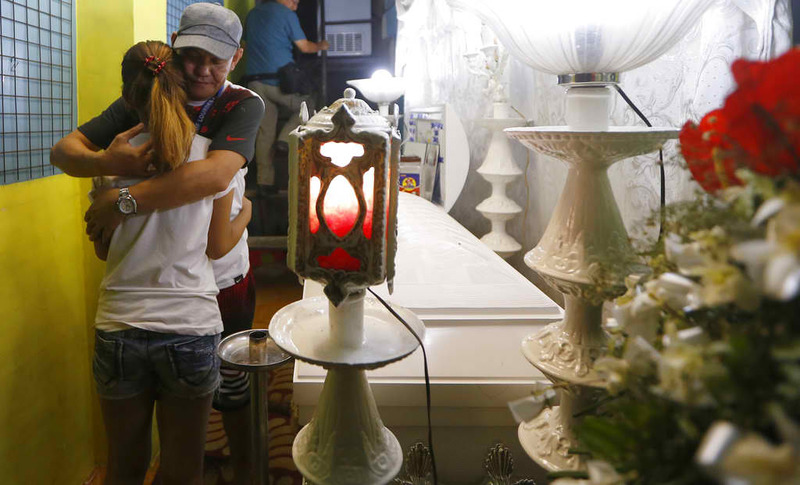 Except for a few exceptions, all major political parties have nothing to offer Kian’s family. Not a pledge to mobilize its elected members. Not a promise to move the levers of power to protect the witnesses. Not an assurance that no stone would be left unturned until Kian is given his due. Like most of us, Kian most probably learned in school about our constitution and our system of structures and offices all designed to supposedly take care of him and the nation. It is taught that in this most sophisticated system — kids like him are protected, the criminals captured/prosecuted/jailed, public officials use their power to serve the people, the police to serve and protect, the Congress acting like safeguards to executive abuse, the courts are there to bestow justice, and so on. Sadly, Kian did not survive the death squad. He can no longer ask his teachers and his parents why the system didn’t work as promised. Which brings us back to the absolute narrow-mindedness, pettiness, partisanship and malice of the question directed at Kian’s father, and the same question directed by hyperpartisan hordes at their perceived opponents. Make no mistake, these are brilliant people, some religious, some members of the press, some highly-educated. But instead of siding with the people obviously betrayed by the president and left unprotected by an entire system — what do they do? They bravely turn to the people, release a torrent of criticism, divide us, and airbrush the role of an entire system that either stood idly by or even cheered on as Duterte and his death squads embarked on their killing spree. Pray tell, did people’s votes magically suspend the operation of a constitution that said we have separation of powers and checks and balances, so that abuses would be checked and immediately thwarted? How flimsy these magnificent temples truly are and how empty their promises? We might as well smash them to pieces. Pray tell, are the voters really to blame for marking those ballots that hot day of May? And that even if we grant only for the sake of argument that the voters erred — an entire system of thousands of elected and appointed officials, organized from the national to the local levels, cannot or refused to remedy the situation? Executive officials, legislators, judges, law enforcers and entire bureaucracy — they all failed to correct the perceived erroneous decision of voters? And how about those who are implied to have made the “correct choice” — don’t they have the “accountability” for not rallying behind a candidate who could have defeated this bloodthirsty goon? The question “did you vote for Duterte?” is as relevant to Kian’s death as the claim that “the 16 million is a mandate to kill”. Both are wrong. Both can neither bring back Kian to life or restore the faith of the public in the police-turned-death squads. These are expressions of the most depraved fans of the rotten system; the difference is that they have different, opposing idols. One holds on to power; the other lusts for it. For the DDS: The deaths signify bloody success for Duterte. For the others who misuse our outrage: The deaths supposedly give them an excuse to say “I told you so. Repent.” One revels in the blood of innocents; the other opportunistically uses it to spite the victims. “We won. This is our time. Addicts’ days are numbered.” is the ecstatic declaration of the trolls who blinded themselves as to mistake carnage for change, fascism for peace. Yes, both want to break people’s spirits, our spirits — for it passes on to us, the people, the blame for Duterte’s maniacal war, and the utter failure of this system to stop him. Mocha Son claims we want this; Raissa Robles and her ilk accuses us of begging for and deserving it. I say, to hell with them both. We hold that Duterte bears responsibility for Kian’s murder. His cry for innocent blood, his order to plant evidence, his offer of protection for killers, his encouragement of death squads — the list is long — all led to that fateful night. Duterte made it possible to turn the police into a death squad. They snatched Kian as he closed his family’s store, punched him senseless, gave him a gun, made him run, shot him to his death, planted shabu sachets on his body and a gun on his left hand. Just like how Duterte told them to do. We denounce Congress, the courts, and the entire ruling system for allowing Duterte to go unchallenged and unchecked. They are quick to unite to bury the dictator, or to impose martial law in Mindanao, but they cannot lift a finger to protect Kian. Ultimately, we see in our friends and their reactions a fundamental difference in outlook and world view. There are those who deceive, betray, steal from, kill and blame the poor. For them, the poor are mere numbers or pawns. Nothing is more important than the elections and their idols’ rigodon on who and when to lead this system. And then there are the others who see in our poor workers, farmers, the urban poor, the middle class and the entrepreneurs the country’s bright future. They carry a progressive and revolutionary vision: fairness, equity, equal rights, broadly-shared prosperity. They see the system as fetter to progress; It is a corrupt and rotten system that they can’t wait to replace. They are clear-eyed — and resistant to hyperpartisan BS from both sides — about the central political task at hand: Unite to denounce Duterte, to stop the killings, to give justice for all victims. May the most tragic case of Kian delos Santos — Kian of the Saints — stoke a most powerful national outrage. May he and the others cause a national epiphany that we, the people, must come together to save our country and our kids. thanks Sir for this insightful piece. A bit of frustration however that we need the likes if Kian’s fate for ultimately realizing the misjudgement of pro-Duterte votes.